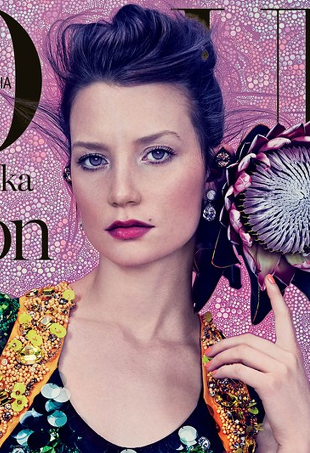 "Another cover that had the potential of being great, but ended up being OK."
She's best known for her role from Tim Burton's version of Alice in Wonderland back in 2010, and now Mia Wasikowska is Interview's August cover subject. After going overboard with the Photoshop for two months in a row, you might expect Vogue Australia to have gone into safety mode. A report card on the hottest and coolest red carpet trends seen at the 2013 Toronto International Film Festival. Venice’s annual film festival attracts a pretty global crowd looking to ride the infamous water taxis and attend a variety of premieres. Milla Jovovich, Diane Kruger, and Cheryl Cole also made this week's top 10. Angelina Jolie, Jessica Chastain, and Rosie Huntington-Whitely also top this week's list. The good, the bad, and the ugly of this month's covers. Rose Byrne, Selena Gomez and Florence Welch are amongst are best dressed this week, proving that age is no barrier when it comes to looking stylish.